During the holidays my friends at Melissa’s Produce sent me their new cookbook, “50 Best Plants on the Planet” The Most Nutrient-Dense Fruits and Vegetables, in 150 Delicious Recipes. Brightly colored pages fill the book with produce ranging from A – Arugula to W – Watermelon each with photos and fresh recipes to try. The photos, so stunning and life-like, make you salivate just viewing them. 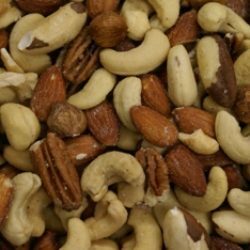 With 150 recipes, deciding which one to try first was difficult. 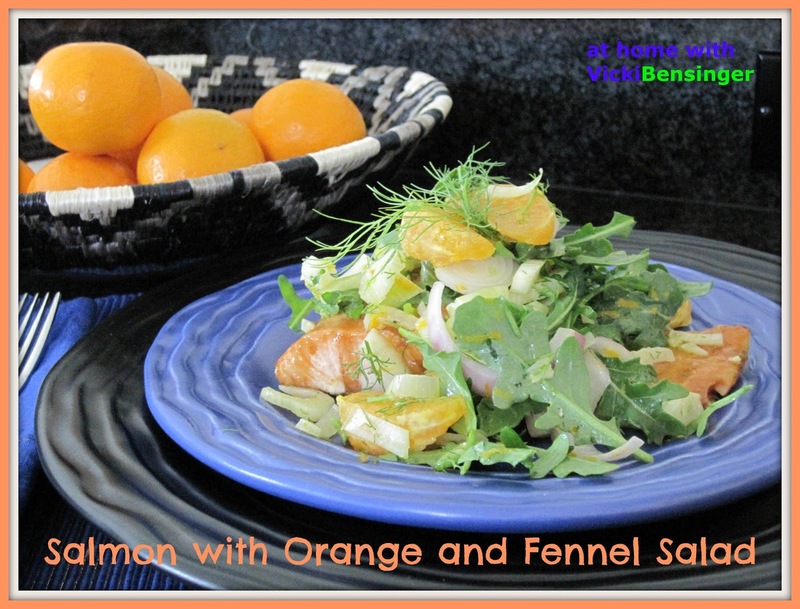 My family loves salmon, and after receiving a box of Melissa’s Ojai Pixie Tangerines I opted for the Salmon with Orange and Fennel Salad. Simple to prepare, with a light, refreshing vinaigrette, tossed with the crisp fennel salad to top a perfectly roasted salmon – this dish was a winner! I wish I could show you every page of this extraordinary cookbook but instead, if you’re of fan of fresh fruit and vegetables, I highly recommend purchasing one of your own. Eating a rainbow of foods on your plate each day is key to a healthy and long life. “50 Best Plants on the Planet” by Cathy Thomas, Angie Cao and Cherl Forberg, is sure to deliver just that. To get the recipe for this heart healthy, refreshing dish, please read below…….. In a medium bowl, whisk together the zest, orange juice, and mustard, then season with salt and pepper. Whisk in oil in a thin stream. Add onion and toss. Set aside. Trim off dark green stalks and feathery fronds from fennel bulbs. Roughly chop fronds and set aside for garnish. Quarter bulbs lengthwise; cut out and discard cores. Cut the quarters into very thin crosswise slices with a mandoline or sharp knife. Add fennel slices, chopped fronds, and orange sections to vinaigrette. Gently toss. Place salmon on four dinner plates. Add the arugula to fennel mixture and toss; spoon the salad over salmon and serve. * I used Ojai Pixie Tangerines in place of oranges. 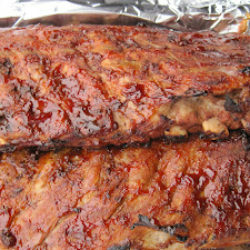 Not only are they delicious, juicy and sweet but they're easy to separate - perfect for this dish. ** Supremes - To cut citrus fruit into supremes (peeled segments): Cut the top and bottom off through the white pith to reveal the flesh. Place fruit cuttside down on a work surface. Following the contour of the fruit, cut off the peel and pith in strips with a sharp knife, starting at the top and cutting down. Working over a bowl (to collect juice), use a small sharp knife to cut parallel to each section's membrane, cutting toward the center. Repeat until all the sections are removed. Squeeze the "skeleton" membranes over the bowl to remove any remaining juice. *** I didn't use any canola oil since I roasted my salmon in the oven. When roasting or grilling if you leave the skin on it's not necessary, in my opinion, to use oil. When removing salmon from the oven or grill, simply take your spatula and gently slide it above the skin and under the salmon - lifting salmon up and placing onto your plate. This method is quite simple and avoids the fish sticking to the grate or pan. That said, I do not flip my salmon using this method. If you prefer flipping your salmon then follow step #4 above. This is THE perfect summer salad and as we are still in summer here I’ll prepare it this weekend! Our weather was still cold but I made this anyway in my oven. It made me feel like spring was already here. 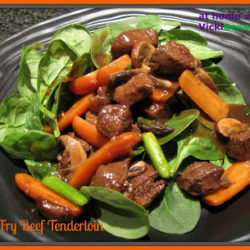 Such a light and spring inspired dish! I’ve seen fennel lately. I only use fennel bulb for soup and stews, but it’s time to make some changes! It must be delicious to eat that in salad. I have to give it a try! It is nice having it in salads. Fennel gives a fresh taste and nice crunch to a salad. I hope you’ll try it. What a delightful spring salad! It has all my favourites in it. Great way to use fennel! One of my new favorite veggies, as you know. Love the combo with salmon and orange – sounds incredibly tasty. Thanks for this. I absolutely love fennel salads and the combination with the orange and salmon must be delightful! An absolutely beautiful salad for someone who definitely eats them all year around 🙂 ! Love fennel and about 80% has always been used for salads! 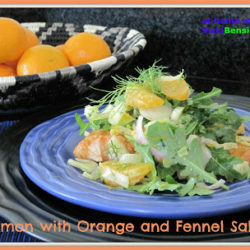 Salmon salad with oranges (especially if these are tangerines) and fennel sounds like a win-win combination. 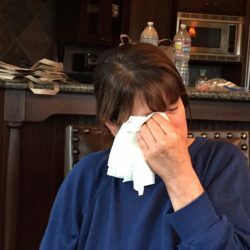 Vicki, I loved the citrus vinaigrette dressing! Hi Vicki, your plate of salad sure look inviting. Awesome combination! I love your blue plate, very elegant. The basket very nice too, love it.